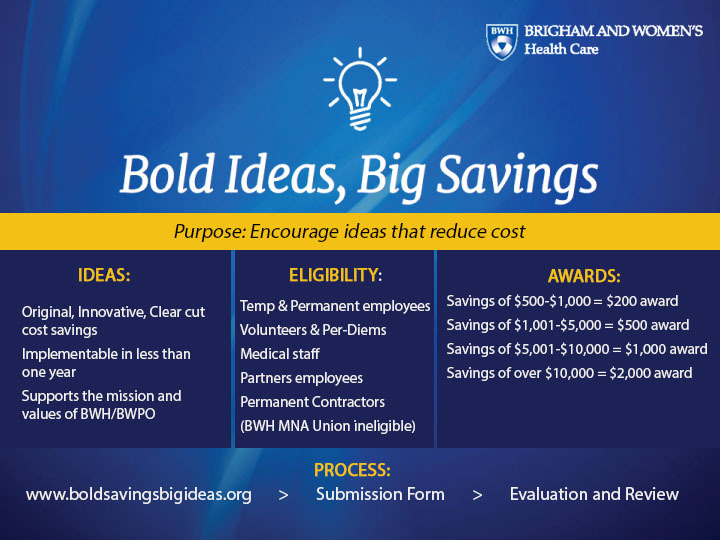 The BWH Audiovisual Services team was the first group to be recognized in the Bold Ideas, Big Savings program. Their team idea, which began as a pilot in fall 2015, is set to save BWH more than $50,000 in the next year. At the Dec. 1 BWH Town Meeting, BWHC President Betsy Nabel, MD, awarded the A/V team with a $2,000 cash prize for their thrifty thinking. Peter Linck, manager of Office Services, explains how the A/V team put their bold idea into action. What is your team’s cost savings idea? The initiative is to save BWH money by internally moving furniture for events. In the past, BWH departments have contracted with an outside vendor in order to move furniture for events. I kept hearing numbers like $1,200 to wheel furniture around. Our A/V staff are there for these receptions anyway, and we can be there closer to the time when the furniture needs to be moved. Previously the vendor would come in late at night or early in the morning to move furniture offsite and then bring it back later, which wasn’t ideal for patient access. We are there closer to the time of the event – we tack on a bit of overtime to do the moving ourselves, which departments are happy to pay. Chairs, tables, everything that the vendor would. We met early on with Environmental Services, Security, Catering and Ergonomics and got their take on the best times to move and how the process should work. Ergonomics provided us with training on how to avoid injury and there’s a Healthstream course that our team completed. We decided there were three tiers of what to remove and what to leave. Security coached us in the placement of the furniture in order to be in compliance with fire codes. How does this save BWH money? By moving furniture in-house, these tasks can be completed closer to the time of the event at a cost of around $100 in overtime instead of around $1,100 per event to hire a vendor. How’s the program so far? We’ve saved about $10,000 since the pilot started in September 2015. It is going great. BWH departments are happy because they don’t have to write the P.O. and our team likes it because they get the extra overtime.